Col. Bob Groom (Kentucky 1824-1899) came to Arizona in 1862. Although he lived principally by prospecting and mining, Groom was also a surveyor who surveyed the townsite of Prescott. He was a member of the first Arizona Territorial Legislature. 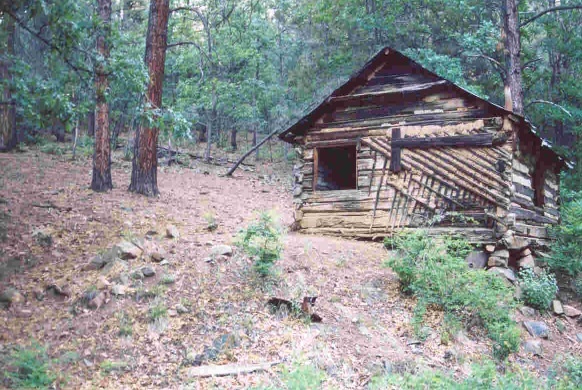 An increasing number of residents settled in the Groom Creek area, but few chose to remain the year round because of the severity of the winters. However, by 1901 there were enough families at the location of the present Groom Creek settlement to warrant establishing a post office. The name selected was Oakdale, because of the situation of the community in a grove of oaks. Officially the name lasted about six weeks, at which time it was changed to Groom Creek. 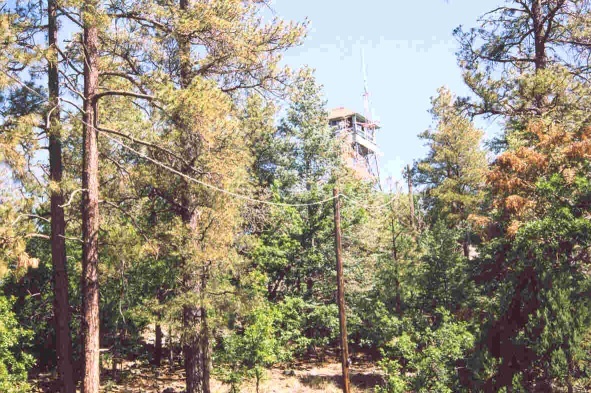 The townsite for Groom Creek City was recorded in Prescott in 1903. 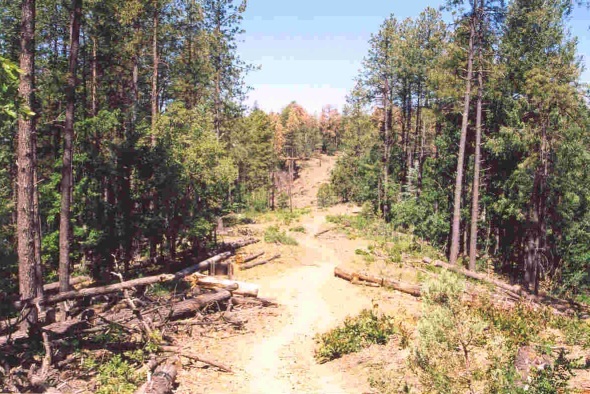 The trees on Spruce Mountain are referred to as spruce, but they are actually Douglas fir. The trailhead was empty when I arrived around 5:30 in the morning. The sun had not broken over the eastern horizon splashing us with a new day: it does not matter anyhow, at 7696 feet, Spruce Mountain would block the early morning sunshine a little longer. The only hint would be the bright glow of sunlight in the top of the trees and on distant mountains to the west. The air was chilled when I stepped out of my Jeep. Refreshing to feel. Not a soul was in sight I was alone here. The only sounds were my own as I made ready for the hike and a dog barking at something, anything, real or unreal from a nearby residence. Ready, I launched past the trailhead sign and began my hike. 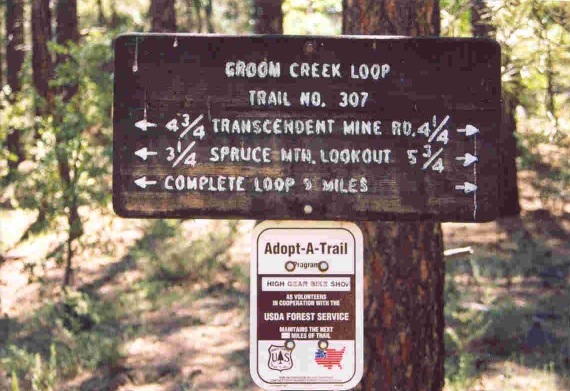 Many folks prefer to hike the loop in a clockwise direction, or turning left at the sign. I rather go counter-clockwise to the right of the sign. The trail to the lookout tower is longer then, but by my way of thinking, by the time I get up there most of the trail is done and then it is down hill all the way. Most of the trail is well marked and easy to follow. 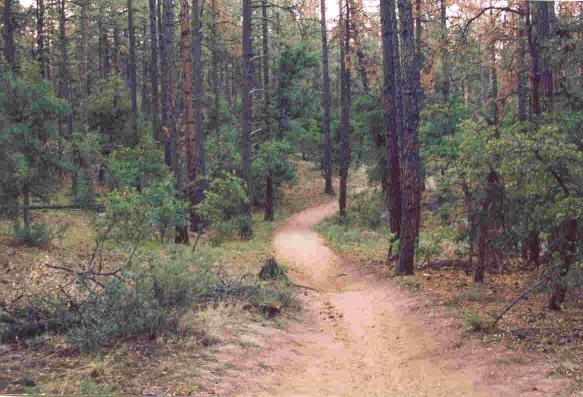 Near the trailhead; however, the trail is a bit butchered by dirt roads, old roads and old trails crisscrossing around the area. It is easy to get side tracked, as I found out later. The trail begins its climb to the top gradual. I hardly notice the climb. I was taking in the feel of the cool air on my body, the shadows of the forest, the smell of nature, and the singing of the birds. Delightful really. Until I heard something crashing through the brush away from me! I stopped and looked deep through the woods and shadows to see if I could catch any movement. The loud thrashing ceased, so I looked and listened more intently; until yes, movements down the trail about 75 yards. It was a doe and she stopped to look my way, like she was studying me as I admired her. She ambled away through the trees. I surveyed the surroundings to see if I could spot any more deer following her, especially a buck, to no avail though. 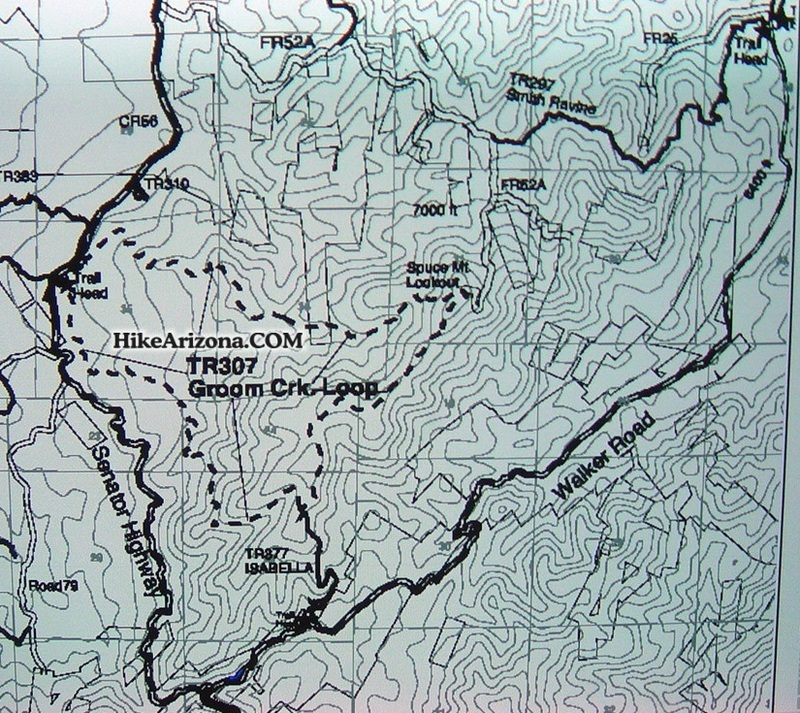 An hour into the hike the trail turns to the right and an old road appears to go straight. 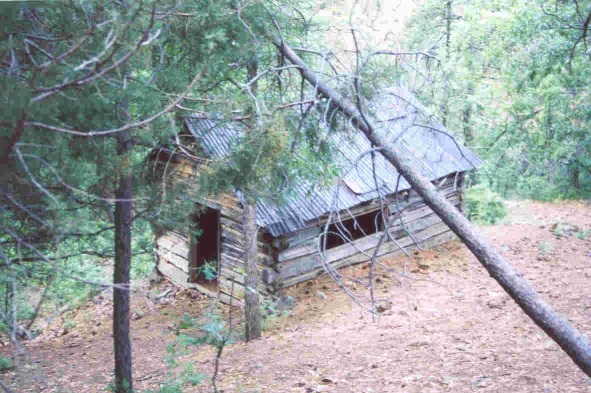 I took the road to visit Coles' cabin. I do not know anything about the cabin and the Coles, other than a warning painted above the gaping window, "KEEP OUT THE COLES". 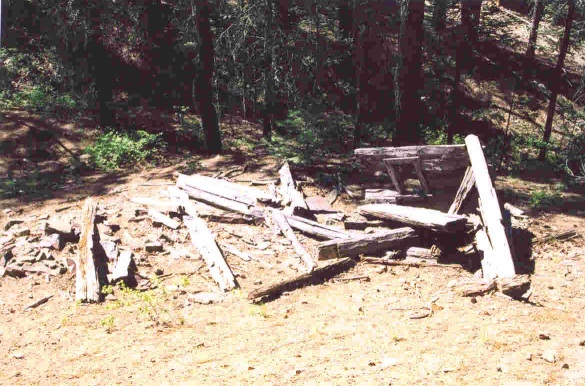 I imagine a miner built the cabin. I have never looked hard for a dump, a rich source to determine who may have lived here. 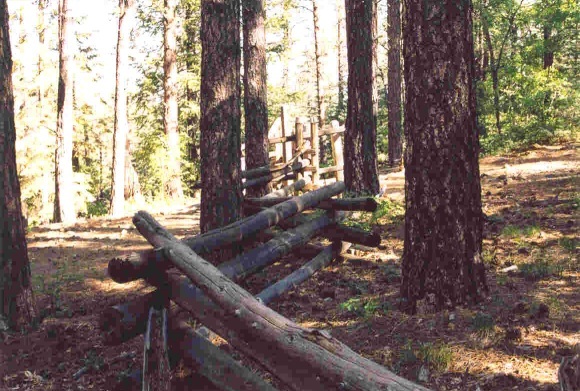 The only thing I have found beyond the cabin is what appears to be a corral built from native pine. We press on, leaving the cabin and returning to the trail. After a couple of hours my walk comes to the junction of trail #377, Isabella Trail. I stopped to take a break. From this point the trek is very pleasant. 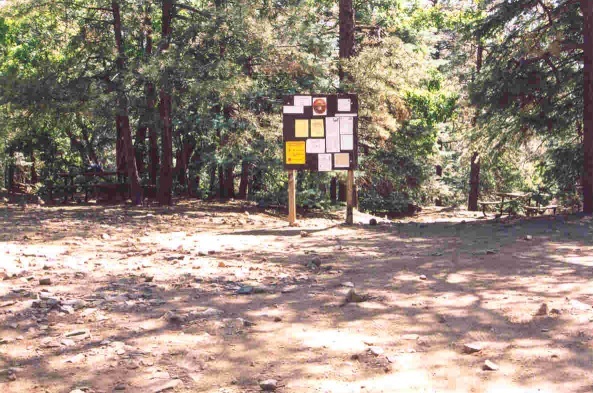 When I resume my walk I pass a forest service helo pad sign to my left. I enjoy my solitude and thoughts alone. I passed a fence, somewhat upset that somebody left the horse gate opened so I shut it. My pace quickens as I knew I was getting closer to my objective and a late breakfast. 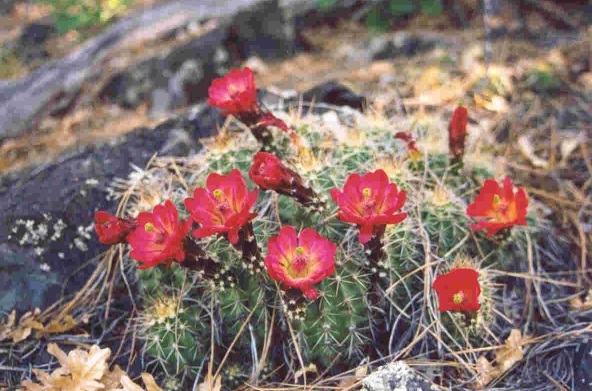 But not so fast that I did not stop to admire the colorful blooms of a cactus or even wonder about a pile of rocks on top of a tree stump. What the heck is the purpose of that? 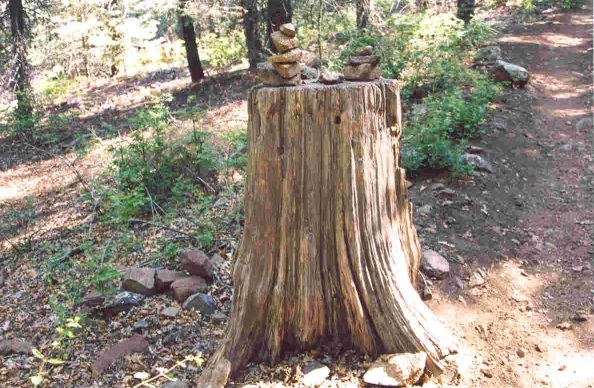 A cairn to mark a well used trail or was someone making a statement? Who knows, except the person who placed them there? I was getting close. I passed a hiker going the other way talking on his cell phone, another fence, a small brick building, a large propane tank next to it, and a small tower with antenna array. The opening appeared and I spotted the lookout tower in front of me. It was open for business because I noted the windows opened and an American flag fluttering in the breeze. Today I decided not to visit. On my right was forest road 52A and the small picnic area. On my left trail #307 continues. First matter to attend to before I continue, my late breakfast. 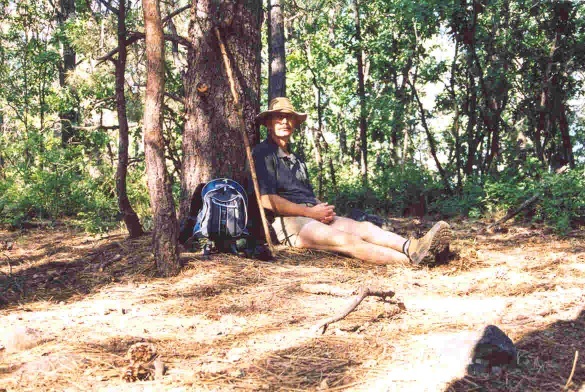 I picked a picnic table under the shade of the pines, settled down and devoured my well deserve treat of peanut butter and jelly sandwich, yogurt in a tube, and apple sauce. Washing it all down with water. After my appetite was slated and I rested for a few: I saddled up and moved out. I was only on the trail for a few moments when I stopped short in surprise. 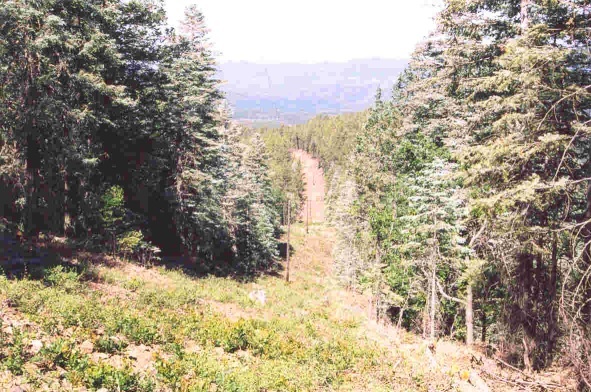 My God, there is a wide swath cutting into the forest parallel to the small power line. It was as if a large lawnmower was placed on earth and cut down the side of the mountain through the forest, leaving the poles carrying the power up the mountain alone! Clean, sterile, bare. 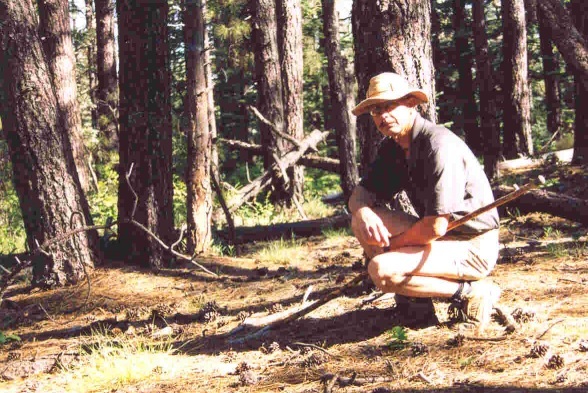 I stood staring down the gash in disbelieve, fascinated, and sadden: I now understood the severity of our drought and the natural cancerous blight of the bark beetle. The swath was not here last year when I hiked the trail. 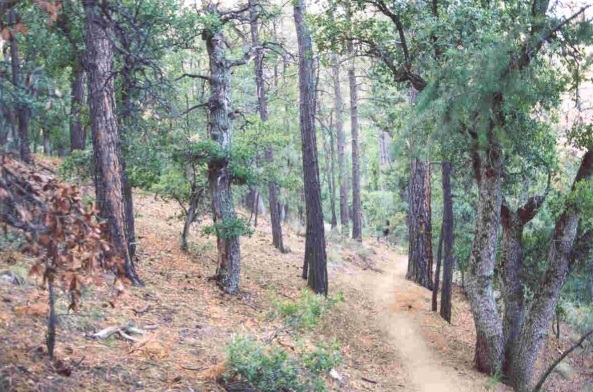 I now felt exposed as I walked down the mountain, the cut crisscrossing the trail every once in awhile. At one point I caught the view to the west and spied the blacken remains of the forest from last years Indian fire. The walk back was quick. 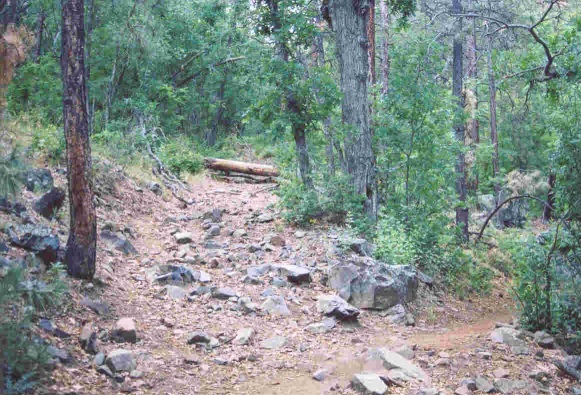 I passed several hikers, a couple riding horses, and a mountain biker coming up the trail. I found the biker interesting as I yield for him because he was struggling uphill: it seems for every ten cranks on the pedal he moved only a foot! Thinking about it, I calculated he would have cranked the pedal 171,600 from the start of the trail, to the lookout tower! Marching on down the trail I spotted the remains of a collapsed cabin in a draw. Not much remains to tell the story. Near the trailhead on the right of the trail I spotted the neatest thing I have ever seen. Rock Art! 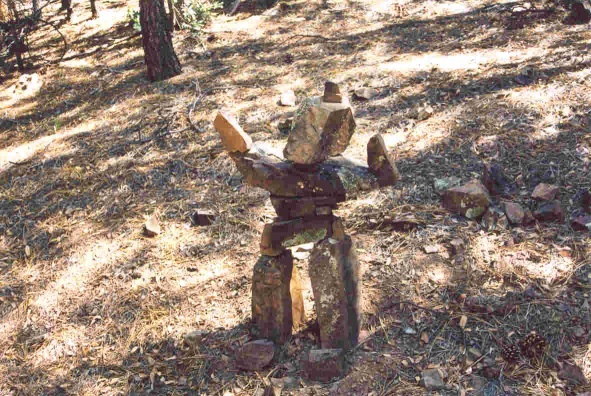 A manmade sculpture using the rocks around. Is it a man? Or, is it a woman? Maybe neither. Maybe it is a statement about humanity sharing and understanding the forest or the world. Or a wise cracking kid seeing a pile of rocks and seeing what he could do with them. Never mind, only the artist knows his reason. Not long after passing the rock art I ran into a well-maintained dirt road. Do not do what I did and keep going, long story. Hook a right on the road, the trailhead will be off to the left. And when I finally arrived, the trailhead was cram packed! In closing, I love this trail and aside from the swathin the forest, which surprised me, I enjoy the feel of this trail in the morning. 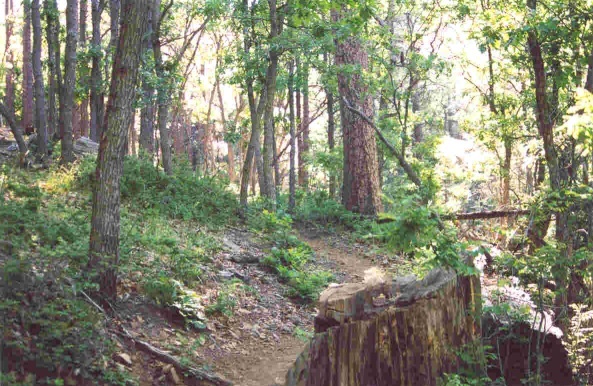 I think it makes an excellent conditioning trail for long hauls on other trails. 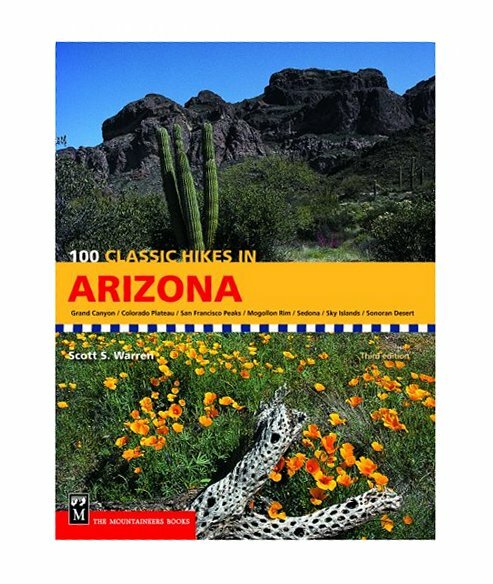 And I have hiked it prior to climbs up Humphrey Peaks and down the Grand Canyon. A wonderful way to inventory a person's physical condition. On entering Precott off Highway 69 travel down Gurley Street to Mount Vernon, aka The Senator Highway. Turn left (south) and drive down the Senator Highway for 6.4 miles. The trailhead will be to your left.